Based on what I read I thought that the book had a lot of information. And how the stories were divided instead of being smushed in one whole paragraph. The things I liked about the book was…… that the stories were detailed and had the correct pictures to go with the stories. The things that I didn’t like about the book was…. It had a lot of spelling errors, so I couldn’t really get what they were saying until a long time of guessing. Overall, I Like to give this book a 9 out of 10. It got 1 point off because of spelling errors. But I would Recommend this book for ages 3 and up. 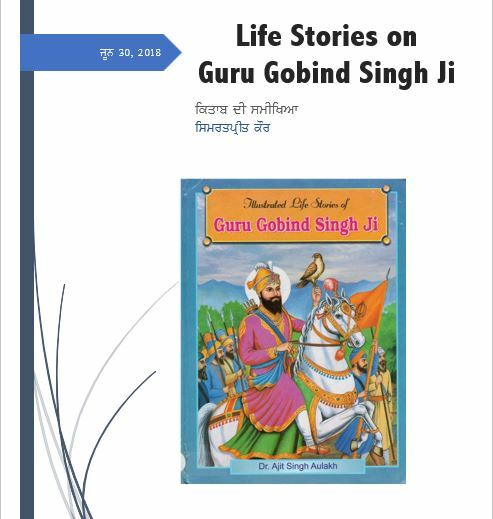 So, this is my Review for Life Stories on Guru Gobind Singh Ji! I hope you enjoyed reading as much as I did writing it! Note – The views and opinions expressed are those of the author and do not necessarily reflect the views of Sikh Religious Society Palatine Gurudwara, to include but not limited to the Board of Directors, Employees and Library volunteers and staff.